The first known painting dubbed The Triumph of Death exists as a fresco in the Regional Gallery of Palazzo Abatellis in Palermo, dated around 1446, creator unknown. In 1562, Pieter Bruegel the Elder, inspired by the earlier fresco, painted a 16th century update for his version, also titled, The Triumph of Death. 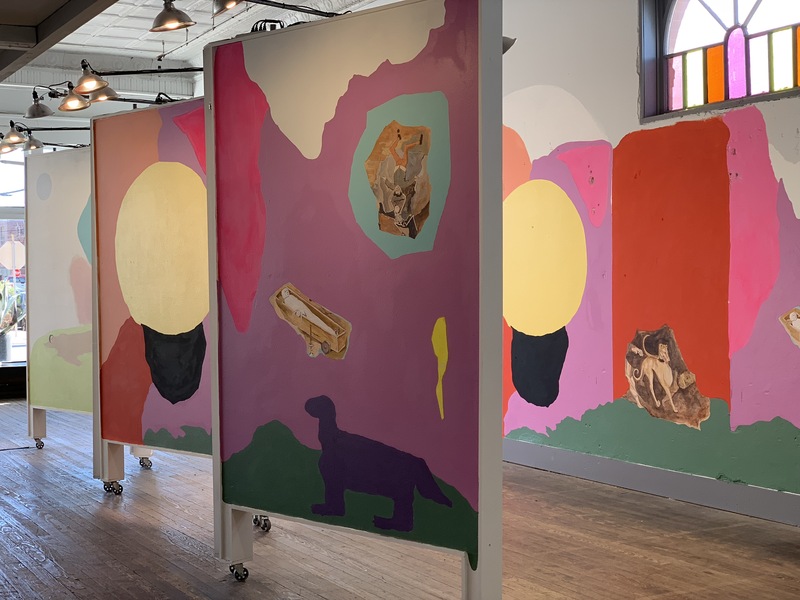 The third iteration, again titled, The Triumph of Death, is currently underway in the form of a site specific painting and sculpture, by artist Hollie Anne Brown. Cut outs of both 15th and 16th century versions are crudely pasted onto a color field which was previously rendered in a slapstick manner on her laptop. In 1446 and 1562 a hypothetical answer was proposed to the question, “What happens when we die?” Bruegel and the unknown artist painted an image of death (personified by skeletons) triumphing over humans, with comic undertones. Curiously, neither painting were biblically derived. Brown’s 2018 version does not propose an answer to this question, rather it honors the beauty of questions remaining questions. Images alluding to the sun and black holes, representing questions of life and alternate dimensions, take a center spot in her two seemingly identical murals, each over 25 feet long and 8 feet high. On the evening of November 2nd, 2018, the finished version will go on display. Sometime later the murals will be buried in the wall under a few coats of white paint. Hollie Brown lives in Lockhart, Texas. She received her M.F.A. from the University of California, Riverside, and currently teaches at Texas State University in San Marcos, Texas. 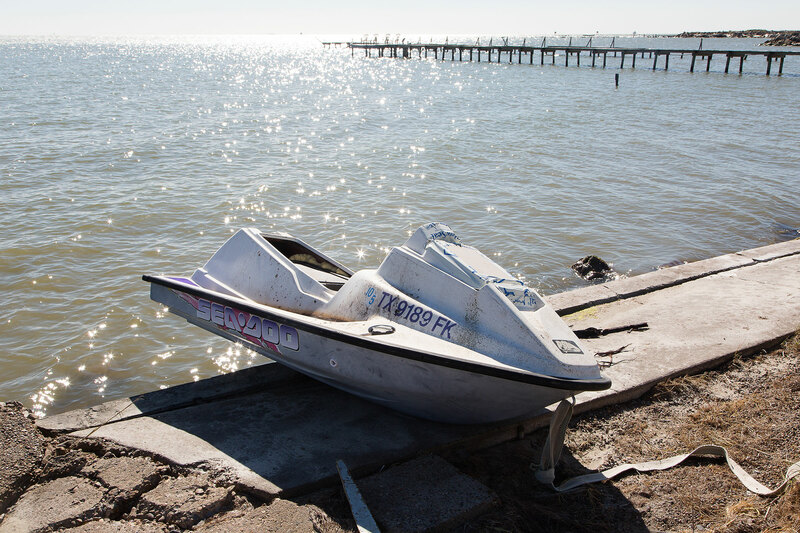 Leading up to the second anniversary of Hurricane Harvey (2017), Spellerberg Projects presents a new installation of Austin, TX-based artist Elijah Barrett’s work of photography, Rockport. The series unfolds in a small Texas town along the Gulf Coast in the aftermath of the storm. On its surface, the group of photographs takes the form of a conventional photo essay, but its vantages are more oblique and open-ended, generating a retelling that is as searching and ambiguous as it is documentary. Rockport is a disorienting, fragmented account of a time between times; a witnessing of the aftermath of the last storm and the anxious anticipation of the next one. From the bare description of the destruction, to the blinding saturated colors, to the bright glimmer of light, these photographs ask us to reflect on the natural impulse to shield one’s eyes or divert one’s attention from what is overwhelming and the strain that is required to see hard realities more clearly.